Rebecca Boger and John Marra of Brooklyn College, City University of New York (CUNY), along with the National Park Service (NPS) and Gateway Research Learning Center (previously the Jamaica Bay Institute), organized a Bioblitz of Jamaica Bay from 3pm Friday, September 11th through 3pm Saturday, September 12th 2009. Briefly, a Bioblitz is a 24 hour event aimed at cataloguing the diversity of organisms in a particular area. This Bioblitz was part contest (racing against the 24 hour clock), part educational event, and part scientific endeavor. We hope it increased the public’s awareness of the diversity of their own “backyard,” while highlighting the need to protect sensitive ecosystems like Jamaica Bay. 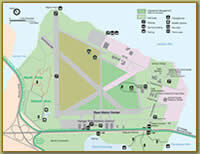 The Ecology Village at Floyd Bennett Field [directions] is the "Base Camp" where registration and all public activities will take place. Here we will have the scientist tent, tally board, and serve water and refreshments throughout the 24 hours. From here, groups will go out to survey various locations within the Gateway National Recreation Area in the vicinity of Floyd Bennett Field. We will have a group of Experts in their fields to lead taxon groups, but we are looking for Amateur Naturalists and Volunteers to help with the surveys and registration. All Experts, Amateur Naturalists and Volunteers must register by downloading the registration form [PDF] and emailing it to the contacts below, or bringing the form to the registration table at the "Base Camp". Also, you must fill out appropriate waiver (individual or group), and permission (photo release, parental) forms. You need only bring the waiver and permission forms with you to the registration table at the "Base Camp" in order to participate in the BioBlitz. At 3pm on Saturday, we will have closing ceremonies where we'll announce the final species count and present descriptions of interesting findings.